Most likely your entryway to Kyoto is Kyoto Station, and if you are expecting to visit a city of ancient traditions, you may well be surprised by this ultra-modern 60 meter structure of shining glass and grey steel. Japan’s second largest station (the biggest is Nagoya), it was built to accommodate the millions of visitors Kyoto receives each year, and it does so with panache, housing within its mighty frame excellent facilities, information centers, stores and restaurants to service their every need. The story of Kyoto Station, though is a story of Kyoto’s progress through the modern era. 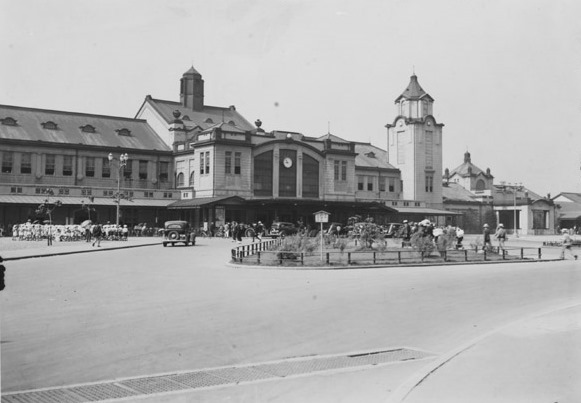 Three Kyoto Stations were built before the current building, each showing a gradual increase in size and utility. The first, built in 1877, was built in red brick, the most modern material of the time, and seemed to usher in a new era of technological progress. Much excitement attended its opening ceremony, which was attended by the Emperor Meiji himself. Situated a little to the north of the current structure, this building was familiarly known as “Shichi-jo Stensho” (“Shichi-jo Station” in the Japanese approximation of English at the time), after the main road which it faced. As the number of people using Kyoto Station increased, it became necessary to build a new and bigger station. The second Kyoto Station was built in 1914 to coincide with the enthronement ceremony of the new Emperor Taisho in Kyoto Imperial Palace. This building was an elegant and spacious Renaissance style structure and considered an object of pride by the national railway. 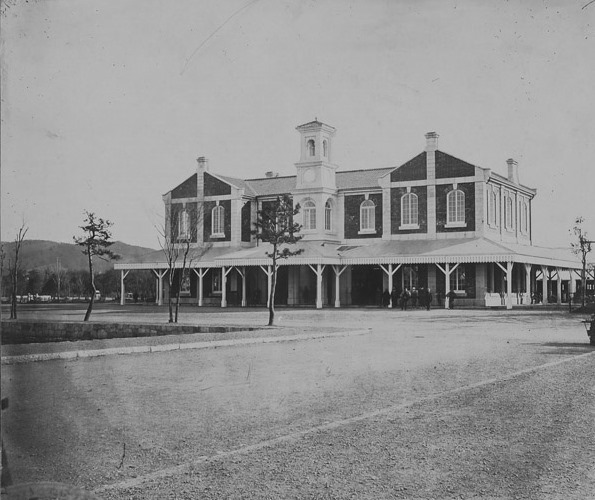 Built largely of cypress wood it stood pretty much in the area of the current building, the site of the first station becoming an expansive public square. Unfortunately, on November 18th 1950 someone forgot to turn off an electric iron in one of the station’s changing rooms. This mistake caused a fire that quickly spread, as cypress wood burns easily and the station was completely destroyed. 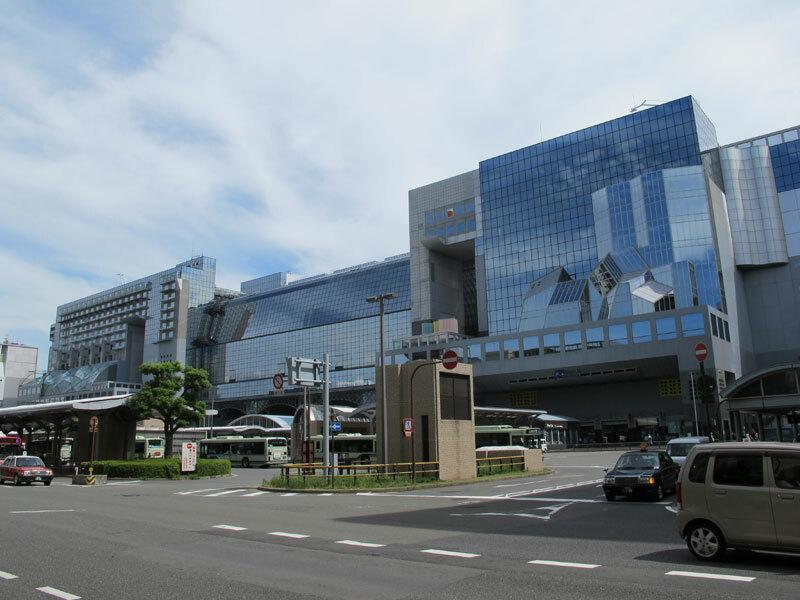 The third Kyoto Station was built in a hurry to replace the one that had been lost. A blockish two storey structure with an eight store tower, it was built in the popular material of the day: concrete. It was large and practical but ugly. 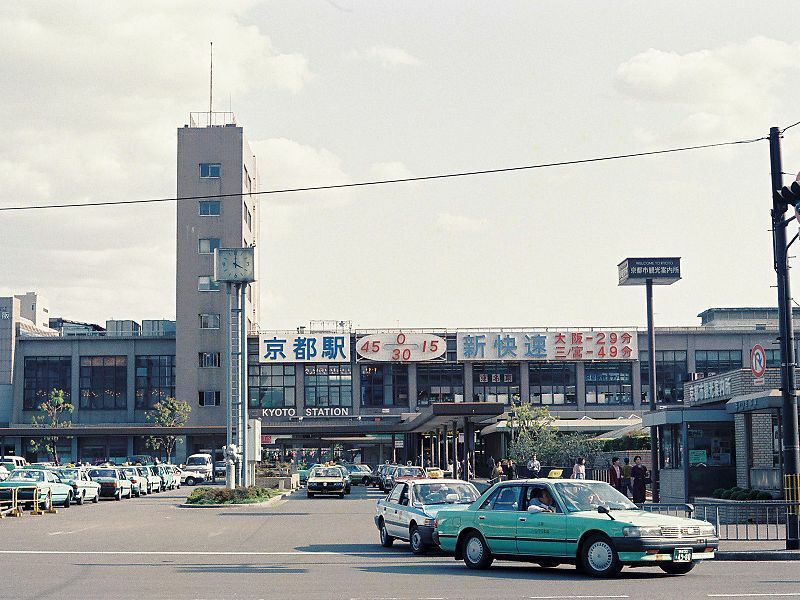 As Kyoto increasingly modernized, with bullet train connections and a subway, calls began in the 1970s for a new more visually appealing building. Deliberations continued for two decades over a suitable plan. The third Kyoto Station: a striking example of 1950’s concrete utilitarianism. Finally in the 1990s to celebrate the 1200th anniversary of the city’s founding, a competition was held to decide on a new design. Out of seven competing world class architects, the award winning Hiroshi Hara won the day with his immense, futuristic structure of glass and steel. It was like nothing Kyoto had ever seen before, and many local people opposed it, saying it was an eyesore and out of keeping with Kyoto’s traditional cityscape. Nevertheless, this 15 storey building was completed in three years and seven months and opened to the public in September 1997. Today it still has its critics, but most people on arrival view the main exit’s massive steel beamed atrium at the main exit with nothing short of awe. And with shops, restaurants, a theater, a museum and a “Sky Garden” with pleasant city views, the Station has become a popular tourist attraction in itself.